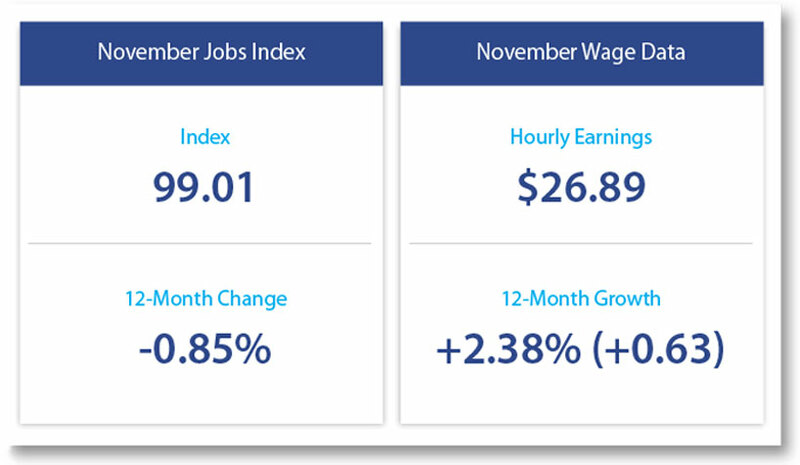 ROCHESTER, NY—The Paychex | IHS Markit Small Business Employment Watch for November shows that the tight labor market continues to make for challenging hiring conditions. The Small Business Jobs Index declined for the sixth consecutive month, falling 0.11% from October to 99.01 in November. Despite the low rate of job growth, the rate of hourly wage growth increased slightly, now standing at 2.38% ($0.63). “With the Jobs Index at its lowest level since 2010, small businesses continue to have difficulty finding workers in the competitive hiring environment of 2018,” said James Diffley, chief regional economist at IHS Markit. The top regions for employment growth and wage growth, respectively, are the South and West. Pennsylvania and Massachusetts are the weakest states for small business job growth; Arizona is the top state for wage growth. Dallas regained its top spot among metros in jobs growth, as did Riverside, CA, in wage growth. Construction reached a new record high in hourly earnings growth at 3.31%. The downward trend continues from its recent peak of 100.78 in February 2017, with a 1.76% decrease in the pace of small business job growth. Just slightly above 99 in November, the Jobs Index declined for the sixth consecutive month. Hourly earnings growth improved for the third consecutive month to 2.38%. Despite hiring difficulties, the rate of weekly earnings growth continued its decline, from 3.10% in August 2017 to 2.41% in November 2018. Following nearly two years of positive year-over-year growth, weekly hours worked growth turned negative in October and fell further in November, down 0.18%.